AMES, Iowa — As an undergraduate, Michael Castellano spent one summer on a New Mexico ranch doing environmental science research. He was inspired by the landowner’s implementation of a grass banking system. “What I saw there as a student got me excited about the power of agriculture as a conservation tool,” says Castellano, the William T. Frankenberger Professor in Soil Science in the Department of Agronomy at Iowa State University. Castellano described the grass bank as an ungrazed pasture, except in the event of drought. In exchange for neighbors’ ability to use the area for grazing, the owners had to put the ranch in a permanent easement, which allowed the land to be sold, but never subdivided. As a result of the easement, the landowners joined together to form the Malpai Borderlands Group, which has protected 78,000 acres of land as natural wildlife habitat. 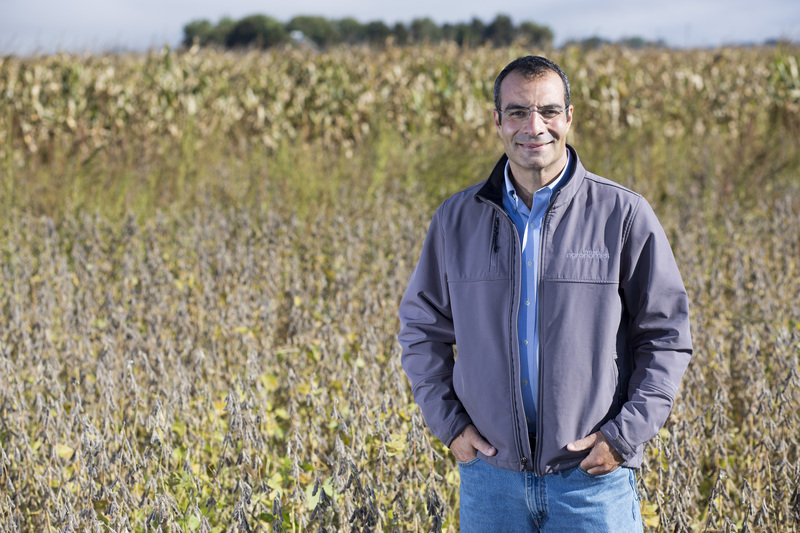 That formative experience left an impression on Castellano and his later research in soil, water quality and conservation at Iowa State. Today, Castellano’s research focuses on understanding environmental processes that control the flow of materials, like nutrients, in ways that increase sustainable and agricultural productivity. He examines how chemical, physical and biological processes interact to impact the environment. He is part of a large ISU interdisciplinary team conducting research that seeks to understand the complex interactions involved in nitrogen and carbon cycling in Iowa agriculture. Castellano says strategies for implementing many conservation practices, such as cover crops, can be improved or optimized. The variability in the effectiveness of these practices results from how the practices fit in with a farmer’s operation. Because no two operations are identical, practices must be tailored for each farm. “I want to better understand and interpret variability to better manage cover crops and other conservation practices in Iowa,” he says. Castellano says it’s important for his research to collaborate with crop physicists, modelers and engineers to form a team of creative thinkers who ask good questions and organize for effectiveness. These teams, he says, are the future of science. Castellano has served as a member of ISU’s Science Assessment Team that laid the scientific foundation of the Iowa Nutrient Reduction Strategy, the collaborative effort of ISU and state agencies to set statewide goals for water quality. Castellano has proven to be a key communicator to the public and decision-makers on how to better understand the science required to make progress on water quality and nutrient management goals. As a member of the Science Assessment Team, he continues to demonstrate the need for continued research and innovation to address water quality needs of Iowa and the nation. As the inaugural holder of the William T. Frankenberger Professorship in Soil Science since 2015, Castellano is using the professorship’s resources to sustain long-term studies to answer questions about nutrient cycling that cannot be answered in a single growing season. Castellano says the work can help quantify the effectiveness of current practices for reducing nutrient losses from agricultural fields. Castellano’s research is continuing the legacy of soil science and scientific contributions made by the namesake of his professorship, William Frankenberger. Frankenberger, an Iowa State alumnus, is a renowned scientist and entrepreneur. He is a distinguished professor emeritus of soil microbiology and biochemistry at University of California-Riverside, where he retired in 2011 after 30 years of service. His research contributions were in soil enzymes, microbial transformations involved in remediating contaminated soil and microbial production of plant hormones in soils. He holds three patents, and helped to create the Center for Technology Development at the University of California-Riverside to spur technology transfer through the commercialization of research discoveries. The University of California system cited Frankenberger’s work on microbial detoxification of soils as one of its 50 greatest accomplishments in the last 50 years. Frankenberger earned his master’s and doctorate degrees in agronomy from Iowa State. He and his wife, Margaret Beebe-Frankenberger, established the endowed professorship at ISU to recruit and retain outstanding faculty working in soil biogeochemistry and the soil sciences. Castellano joined the agronomy faculty at Iowa State in 2010. He had been a research associate at Texas A&M University. He received his doctorate in soil science and agronomy from Penn State University in 2009. In 2014, he was honored with the Young Scientist Award by the Environmental Quality Section of the American Society of Agronomy. In 2012, he received the Raymond and Mary Baker Agronomic Excellence Award in Iowa State’s Department of Agronomy.